Growing up in downtown Guayaquil, the biggest city in Ecuador, my days were spent surrounded by colorful buses, honking cars, and taxis screeching to a stop. I remember how I wanted the weekend to start, so I would convince my parents to go to the beach. Just drinking coconut water on a warm sandy beach and watching the crabs eat while the waves smacked the reef. 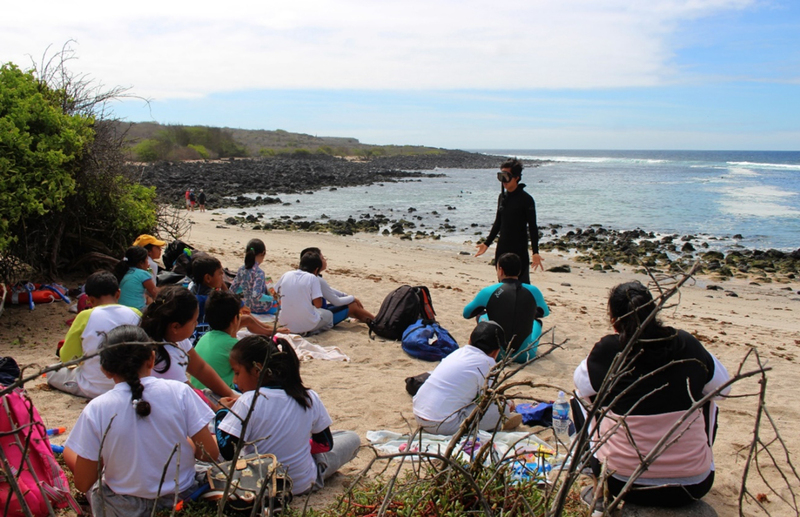 That was a dream, I have always felt connected to nature in a way that after finishing high school, I decided to apply to do volunteer work in the Galapagos islands. The archipelago changed my life by showing me all of the endemism of their land species and the pristine sea that surrounds it. However, the most interesting part was coexisting with animals everywhere. Here, I discovered my favorite activity, scuba diving, and I’m currently doing my dive-master course. It has also showed me that two of the most important things when talking about conservation, are education and engagement. I was a volunteer at the Charles Darwin Foundation (CDF) in the land bird project in 2016. 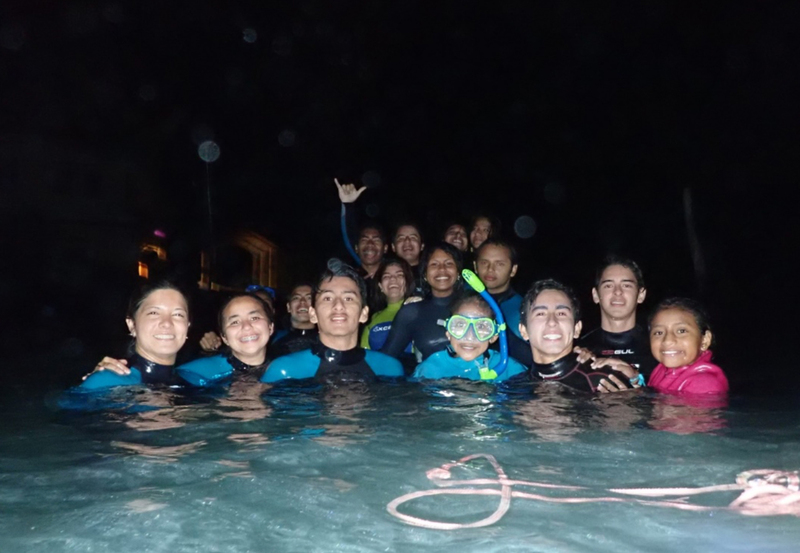 Afterwards, I decided to pause my university education for a year when I applied to a professional volunteer position to help with the CDF’s Marine Education project and was accepted. Developing a close working relationship with the students has been inspiring, as it has helped me see all the pure, untapped potential they have to question what’s happening around them. Not only with science, but with social issues as well. The youth on the island face a variety of daily challenges but we cover these difficult topics by continuously modeling respect, discussing consequences of our actions, cultivating creativity in their work, and addressing responsibility via group study sessions and one-on-one conversations to correlate theory with behavior. It’s important to discover and appreciate self-worth, and my involvement in this program has focused a lot on this. Investing time to work with our youth can provide a long-term solution for the future of the island community. In addition, I feel that if one grows up understanding what is on the beach and the importance of every species, awareness for conservation will prevail. 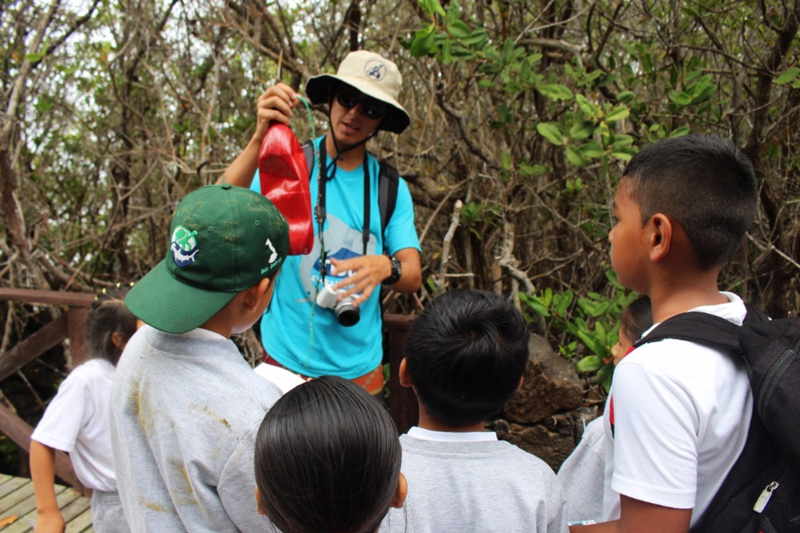 “Marine Mornings,” is the best initiative, if I was a kid I would have wanted to participate! When I first entered the Van Straelen Interpretation Center and its Marine World exhibition, I immediately thought: I can do homework here, it has so many colors and books! 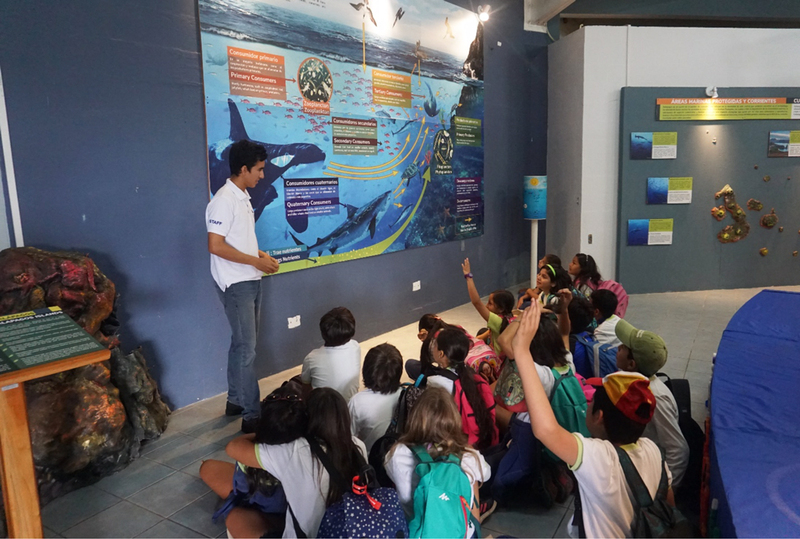 You can also find here all types of information about sharks and the ocean.We visit the beach, in order to see the wildlife and then we have the chance to go into the water to learn how to swim and observe sea creatures. There’s a phrase I always have in my heart that most of the kids have told me: “Thanks for teaching me how to swim, there are so many fish!”. “Shark Ambassadors” is another level of experience. Our 50 students are hungry for information and come every week. On Wednesdays the students between 12 – 14 years old participate, and on Fridays the students between 15 – 17 years old take their turn. It’s not an obligation to come but they come anyway with their curiosity; every day they ask different questions and they’re notorious for how they’re improving criteria for science and society. 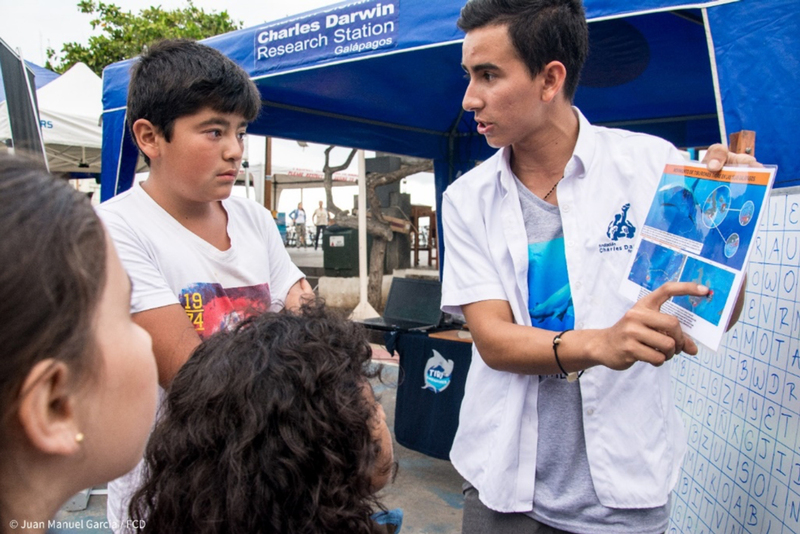 “It is a very fragile ecosystem and we need to do our best to protect it”, mentioned Pelayo Salinas, CDF’s shark scientist. Frequent projects I worked on during university included presenting the most inspiring thing I could see in my dives, the importance of ocean conservation, and I even gave a talk about shark finning. I also discussed plastic pollution and how it affects the oceans no matter where in the world we are. Now I’m teaching children from the community. I am so thankful for this opportunity, and over time, I have seen them positively influencing others by sharing their experiences, setting good examples, and discussing new-found knowledge. This clearly shows their promising future and the pride I have for leading youth program opportunities. 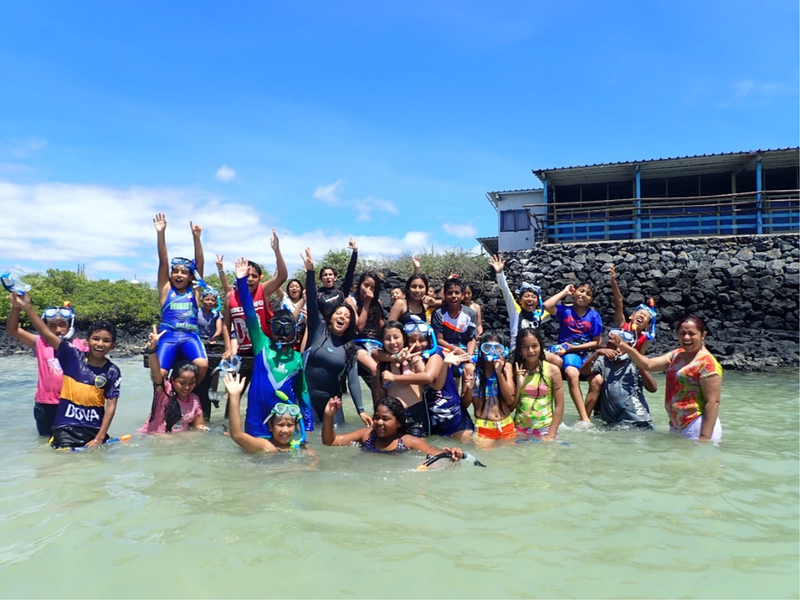 This project is possible thanks to the generous support of Save Our Seas Foundation and a Lindblad Expeditions – National Geographic grant.